Nancy Wozny is editor in chief of Arts + Culture Texas, the only print Texas arts magazine in the state. She is also frequent contributor to Pointe Magazine, Dance Teacher and Dance Magazine, where she is also a contributing editor. Her byline has appeared in The Houston Chronicle, Dance USA's The Green Room, Culturemap, and numerous other publications. She is the winner of the Gary Parks Award from the DCA, an NEA Fellow at ADF, and the recipient of numerous grants for her work in dance, somatics and creativity. She has taught and written about Feldenkrais and somatics in dance for two decades and is currently teaching at Shepherd School of Music at Rice University. She also has served as a Scholar in Residence at Jacob's Pillow since 2010. Hough in Sir Kenneth MacMillan's "Manon." Joerg Wiesner, Courtesy Norwegian National Ballet. Melissa Hough's career is as dynamic as her dancing. After stints with Boston Ballet and Houston Ballet, Hough (our April/May 2011 cover star) joined the Norwegian National Ballet as a principal in 2013, and her dance card has been full ever since. She's turning heads as a choreographer, too. Her work Epic Short, commissioned for Norwegian National Ballet's 2017 Sleepless Beauty program, won Dance Europe magazine's Critic's Choice for Best Premiere that year and recently debuted at the 2018 Diaghilev P.S. Festival in St. Petersburg, Russia. Hough is also juggling her dance and choreography career with motherhood, and has had an incredibly eventful year since returning to the stage last fall after the birth of her daughter. On April 6, she premieres a new ballet called Bout of the Imperfect Pearl for Norwegian National Ballet's Baroque Motion quadruple bill. Hough took a rehearsal break to talk to me about her busy season. Klara Mårtensson in rehearsal for Hough's Bout of the Imperfect Pearl. Erik Berg, Courtesy Norwegian National Ballet. Hough with Houston Ballet principal Connor Walsh in Sir Kenneth MacMillan's "Manon." Joerg Wiesner, Courtesy Norwegian National Ballet. Norwegian National Ballet dancers in Bout of the Imperfect Pearl. Erik Berg, Courtesy Norwegian National Ballet. The Standouts of 2018: Houston Ballet's Nozomi Iijima in Stanton Welch's "Just"
Iijima with Cuhan Wai Chan in Stanton Welch's Just. Photo by Christopher Duggan, Courtesy Houston Ballet. Houston Ballet first soloist Nozomi Iijima transformed into a Zen goddess in the pas de deux for Stanton Welch's Just, commissioned specially for Jacob's Pillow Dance Festival in August. Partnered by Chun Wai Chan, Iijima moved as if in a dream state, casting a deliciously hypnotic spell. It was as if she was literally pouring her weight from one movement to another. Welch's sculptural choreography brings out her most mesmerizing abilities. Even though the ballet is completely fluid, tension slowly builds to a crescendo until finally we feel the pain of loss that memory holds. Her stoic but powerful performance held the audience captive—it was the kind of dancing that you don't want to exhale during. Andrew Vecseri with artists of Houston Ballet in Stanton Welch's Powder. Photo by Amitava Sarkar, Courtesy Houston Ballet. It's hard not to notice Houston Ballet's Andrew Vecseri. With his strapping good looks, athletic build and confidence, Vecseri has a way of standing out in ensemble work without stealing the show. Whether he's dancing in Sir Kenneth MacMillan's Mayerling or juggling multiple ballets in mixed rep evenings, he comes across as a natural leader onstage. And while he's only in his second full season in the company, he has already started to step out of the corps, taking on a lead divertissement in The Nutcracker. Kajiya as Gamzatti in Stanton Welch's La Bayadere. Photo by Amitava Sarkar, courtesy of Houston Ballet. Your director Stanton Welch claims that you can hover in midair. Really? I am not sure that I can do that. I do know that I repeat things over and over because I need to find my own way with each step, and maybe the floating quality happens in there somewhere. I just do it. If you had to pick one signature role which would it be? Just one? I can't. I have two. One is Giselle, because she's a human and not a creature, and people can relate to love and heartbreak. Stanton's Madame Butterfly is also important to me, because I met him when I was 17 and had heard that he thought I would be great in the role. I finally danced it in 2016 and it's a spectacular part. Kajiya as Giselle in Stanton Welch's "Giselle." Photo by Amitava Sarkar, courtesy of Houston Ballet. Houston Ballet soloist Harper Watters has a good thing going on. 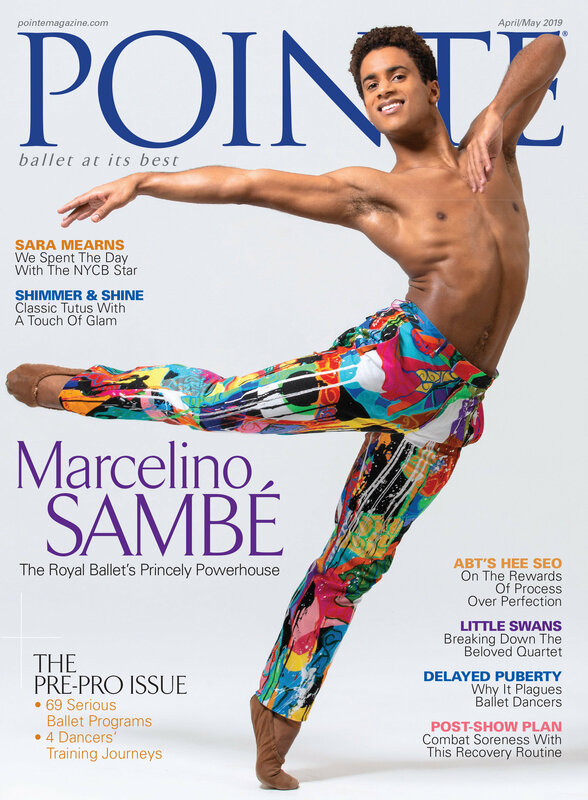 Not only is he one of the company's rising young dancers, but he's also a ballet celebrity on social media, where he charts his life on Instagram and on his hugely popular YouTube series, "The Pre Show" (which he describes as "tons of ballet, banter, boys and lots of backstage shenanigans"). The Dover, New Hampshire, native, who seems just as comfortable in a pair of pink heels as he does onstage, trained at Walnut Hill School for the Arts and Portsmouth School of Ballet. While a member of Houston Ballet II, he landed an apprenticeship with the company after winning the Contemporary Dance Prize at the 2011 Prix de Lausanne. He joined the main company that same year and was promoted to soloist in December 2017. Known for his big personality, elegantly long lines and sensual flow in contemporary work, Watters, 26, is ready to take on the next phase of his career. He recently spoke with Pointe about his new rank and his mission to help others feel proud of who they are. Bloodgood and Ashley Lynn Sherman in "Giselle." Photo by Tony Spielberg, courtesy Ballet Austin. Paul Michael Bloodgood, a longtime leading man at Ballet Austin, ends his 19-year career with the company this weekend in Paul Vasterling's Peter Pan. But in between layoffs and after rehearsals, he's been steadily working towards his next phase: creating a full-length feature documentary called Trenches of Rock. The movie, which focuses on his father's Christian heavy metal band and the challenges they faced in the music industry, has been enjoying screenings at film festivals around the world—and winning awards along the way. Pointe spoke with Bloodgood about how he's feeling as he ends his dance career and transitions into filmmaking. What's on your mind as you wrap up your final performances at Ballet Austin? I just want to be in the moment as much as I can and savor the time onstage with my coworkers. Upon reflection of the past 20 years, the moments of honest emotion and connection with others are what I will cherish the most. There are so many aspects of humanity to explore, and I am so grateful to have had so much time to cogitate what dance has to offer to the human condition. Michelle Thompson Ulerich. Photo by Anne Marie Bloodgood, Courtesy Avant Chamber Ballet. Founded in 2012, Dallas-based Avant Chamber Ballet (ACB) has made a name for itself by presenting works by Christopher Wheeldon, George Balanchine and other major choreographers. Yet its Women's Choreography Project, now in its fourth year, makes ACB a company to watch in Texas and beyond. The Project's capstone is the annual choreography contest; the winner receives a stipend and the chance to set a new work on ACB's outstanding 18-member troupe. Nurturing the careers of women dancemakers is a central part of the company's mission. "As an independent choreographer, I found it almost impossible to get a professional commission," says ACB founder and artistic director Katie Cooper. "One of the reasons I started ACB was to make my own opportunities for creating new works." Chyrstyn Fentroy and Francis Lawrence in "Tchaikovsky Pas de Deux" with Dance Theatre of Harlem. Photo by Renata Pavam, Courtesy Fentroy. Taking a lower rank at a new company can feel risky. But whether you're breaking out of your comfort zone, yearning for bigger challenges or finding a better company fit, you can make a successful transition. Here are three ballerinas whose recent moves have advanced their growth and artistry. Fentroy at DTH. Photo by Rachel Neville, Courtesy Fentroy. Although Dance Theatre of Harlem isn't a ranked company, Chyrstyn Mariah Fentroy spent much of her five years there dancing principal roles. She loved the touring, the repertoire and dancing beside her boyfriend, but she longed to try her luck at a larger company with more variety. And with DTH's mainly neoclassical focus, Fentroy felt her chances of dancing in a classical story ballet getting slim: "I wanted to do a full-length before it was too late."